2018 has come and gone. As we proved with our list of the 100 best pop songs, there was no shortage of quality content released last year. However, today we’re turning our attention to the anthems that didn’t quite get their due. 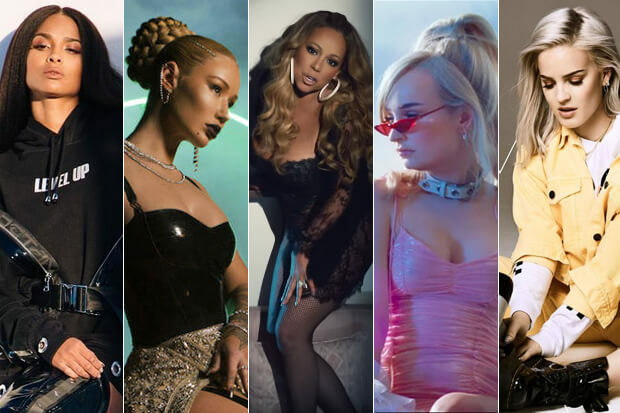 From Mariah Carey’s straightforward kiss-off “GTFO” to Anne-Marie’s nostalgia-inducing “2002,” these hidden gems really should have been bigger on the charts. We compiled a list of 50 of the year’s most under-represented bangers, ballads and bops in alphabetic order for you to peruse below! A summery, nostalgia-inducing anthem with a writing credit from Ed Sheeran – how did Anne-Marie not dominate the Billboard Hot 100 with this for weeks on end? Christina Aguilera kicked off the Liberation era with a demented, club-ready banger that was cruelly slept on by the public. No slow burn here. Sabrina Carpenter’s “Almost Love” is all about taking a deep dive into a relationship, and the bouncy single goes equally hard from start to finish. Celine Dion’s staggering contribution to the Deadpool 2 soundtrack stands toe-to-toe with some of her best ballads and surely deserved to make more than a ripple on the charts this year. Dinah Jane threw it back to her sparkly pop roots on her debut solo single, and she should have netted a “Work From Home”-sized hit. There is nothing subtle about Lizzo’s gloriously thirsty “Boys.” The fact that it should have been a hit is as obvious as the answer to 2+2. MNEK and Hailee Steinfeld linked up over supercharged beats for one of the year’s most vibrant but under-loved collaborations. OneRepublic’s “Connection” had all the ingredients to be one of the biggest songs of 2018. However, the relatable anthem failed to find the required spark. Hayley Kiyoko launched 20gayteen with a banger that proved her more than worthy of the title of Lesbian Jesus. A sensual anthem inspired by Janet Jackson’s “All Nite (Don’t Stop)”? Sign me right up. Troye Sivan featured pop’s reigning princess Ariana Grande on the slinky single, but even that wasn’t enough to garner an appearance on the Hot 100 because sometimes life isn’t fair. A collaboration between J.Lo and rap’s latest queen should have added another hit to both icon’s discographies. It’s an absolute mystery how this was not the case. With every release, Dua Lipa further cements her status as one of pop’s most successful Club Queens. “Electricity” is yet another tribute to how good she sounds over smooth EDM productions. No one does soul-searching balladry quite like James Arthur, and “Empty Space” is one of his best. Lauren Jauregui’s first solo single was a stark departure from her work with one of pop’s most recognizable girl groups. Hopefully we give her latest offering – “More Than That” – the love both singles deserved. No song off Joyride seemed more likely to propel Tinashe back up the charts than her mellow but loved-up “Faded Love.” Easily one of the best songs in her jam-packed discography, it highlights all that she is capable of if we’d give her a chance to truly shine. There is nothing elusive about the meaning behind Mariah Carey’s massively underrated, expletive-riddled slow jam. In a perfect world, this would have become the legendary diva’s 19th number one. Following the breathtaking success of “The Middle,” Zedd’s follow-up single surely should have been equally monumental. However, it unjustly left little more than a blip on the charts. Avril Lavigne marked her return to music with a sweeping ballad tracking her battle with Lyme Disease. I’m still waiting for it to get the respect it truly deserves. Relentlessly hopeful and buoyed by a euphoric production, Kim Petras’ “Heart To Break” defined pop perfection in 2018. I will never forgive The Gays for being unable to send it to the top of the charts. From “Issues” to “Worst In Me,” Julia Michaels has time and again proven capable of capturing relatable emotions and presenting them as perfect tunes. “Jump” is yet another example. Vanessa Hudgens did not save pop music with cult classics like “Sneakernight” and “Say OK” for us to continue sleeping on her musical career. But here we are, once again with her latest should-be hit. To call the roll-out schedule for ZAYN’s Icarus Falls a little overwrought is an understatement. This may explain why none of the singles really had a chance on the charts. However, the silky smooth, early millennium stylings of “Let Me” should have warranted the album’s first global smash. Meghan Trainor has more shimmery pop bops to her name than almost any other hitmaker on the scene. One of 2018’s best was the disco-tinged “Let You Be Right,” which didn’t even chart across the globe. What gives? Ciara sparked a viral challenge with the release of a fast and furious banger. It was enough to propel her back onto the Hot 100 for the first time since 2015, but “Level Up” really should have left more of a lasting impact. Kris Wu set his sights on American markets with the release of “Like That.” He broke onto the Hot 100 after conquering US iTunes, but the breezy cut could have been so much bigger. A tribute to lost love, Toni Braxton’s “Long As I Live” is the defining heartbreak anthem of 2018. World-weary but gorgeous, it offers a mature glimpse into moving on without your heart’s true desire by your side. Shawn Mendes gave us his best Justin Timberlake impression on his funk-laced “Lost In Japan,” and then he teamed up with Zedd for an even more danceable remix. The result has the staying power to compete with any of his biggest hits but inexplicably peaked outside the Top 40. A devastating ode to a relationship on the brink of collapse, Noah Cyrus added another standout single to her discography with the Gallant collaboration. It is hard as hell to figure out why this failed to chart across the globe. With 214 million streams and counting on Spotify, Sean Paul, David Guetta and Becky G’s club-ready banger should have been an early contender for the title of Song Of The Summer. Janet Jackson did everything right with her anti-FOMO bop “Made For Now,” but it only peaked at number 88. Surely, the timely floor filler deserved a higher placement. “My My My!” is the only song off Bloom to make an appearance on the Hot 100, but the frenzied banger truly should have climbed much higher than the Top 80. From collabs like “Youth” to his Suncity EP, Khalid peppered 2018 with a slew of quality content. However, a clear highlight was his work with Martin Garrix on “Ocean.” The restrained club anthem truly should have soared so much higher. Niall Horan proved he had what it takes to make it as a solo star with “Slow Hands,” and he hasn’t put a toe out of place since. However, it’s a mystery why his follow-up singles – particularly “On The Loose” – haven’t rocketed back up the charts. 2019 is going to be the year we stop letting the public sleep on Carly Rae Jepsen. Until then, join me in a moment of silence for her latest underrated, perfect pop release. Despite claiming top honors in the UK, Calvin Harris, Sam Smith and Jessie Reyez’s ode to one night stands only peaked at number 65 on the Hot 100. Can anyone explain this travesty? When are we going to stop ignoring Nick Jonas’ massive potential? The “Jealous” hitmaker has what it takes to be one of the biggest men in the game, if only we’d give him a better chance. Sadly, “Right Now” is another under-appreciated slice of quality pop. Camila Cabello reunited with Pharrell Williams on “Sangria Wine,” which feels like a grown-up relative of “Havana.” However, the sensual bop failed to pick up enough steam to match its predecessor. Club-ready and complete with a neon-hued video, “Say Something” is a clear highlight on David Guetta’s 7. So I really need someone to explain to me how it hasn’t even appeared on the Hot 100 yet. Shockingly, the fourth single from Pink’s Beautiful Trauma failed to chart across the globe, and that’s just not alright. Elle King recaptured the rollicking sass of her breakout hit “Ex’s and Oh’s” on this year’s “Shame.” It is truly a shame that we, the people were unable to return the favor by sending her back into the Top 10. Demi Lovato and Clean Bandit’s stuttering, self-love banger hit the top spot in the UK but peaked at 58 on the Hot 100. Excuse me while I grab a plane ticket to travel somewhere with actual taste. Mike Posner’s “Song About You” is a brutally honest tribute to heartbreak, and the soul-bruising single deserved much more love. MØ and Diplo once again proved to be the perfect musical pair by dropping the thinking man’s Song Of The Summer. And humanity proved that we are unworthy by failing to send their latest release up the charts. A throwback-inspired ode to being himself, Charlie Puth’s “The Way I Am” should have netted the hitmaker another “Attention”-sized smash. Admitting to your feelings for someone has never sounded sexier than it does on MNEK’s Language highlight. The club-ready bop proved the songwriter-for-the-stars had what it takes to front an artist project of his own. Following the breakout success of “Love Lies,” it is shocking that Normani’s equally slinky 6LACK collab didn’t also rocket into the Top 10 (or even warrant a music video). What other songs deserved more love in 2018? Let us know below, or by hitting us up on Facebook and Twitter!